We offer you a complete range of Tablet Testing Systems for the physical testing of Weight, Thickness, Diameter and Hardness of tablets. The tablet samples are measured and tested precisely for Weight, Thickness, Diameter and Hardness (Breaking strength). Round, oval, square and rectangular shapes can be tested without problem. For difficult oval shaped tablets the proven OZB Oblong Centering System can be adapted, this option is also retrofittable. The simple and direct feed by means of the patented Kraemer Elektronik Feeder chute improves the measuring accuracy and reliability. Unnecessary abrasion and contamination of the test stations is avoided through specially developed cleaning and de-dusting devices. 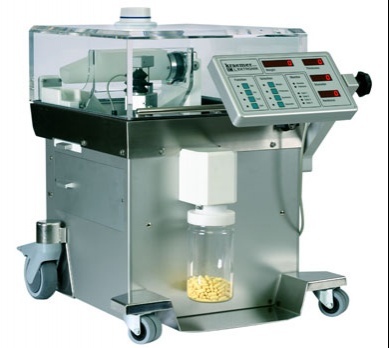 The test stations are automatically fully and efficiently cleaned after each tablet test. Laboratory tester system with PC-Software PH21, fully 21 CFR Part 11 compliant. Online-Production Survey system in connection with tablet presses. 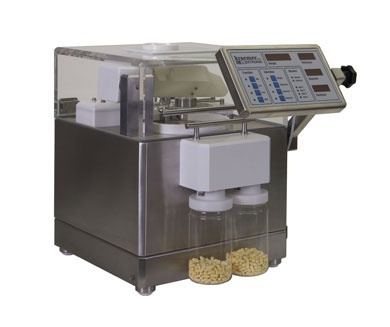 Tablet sampling may be controlled by the tablet press or by the PH21 PC-Software. This model is a DUST-TIGHT Version and provides a better protection to the operators. The UTS-IP-LR is designed in a way that the complete work area room can be cleaned. The housing is, except for the balance, completely sealed. This ensures that no dust may enter the tester. All parts of the UTS-IP-LR that need to be removed for washing can be dismantled completely without tools and afterwards re-assembled. 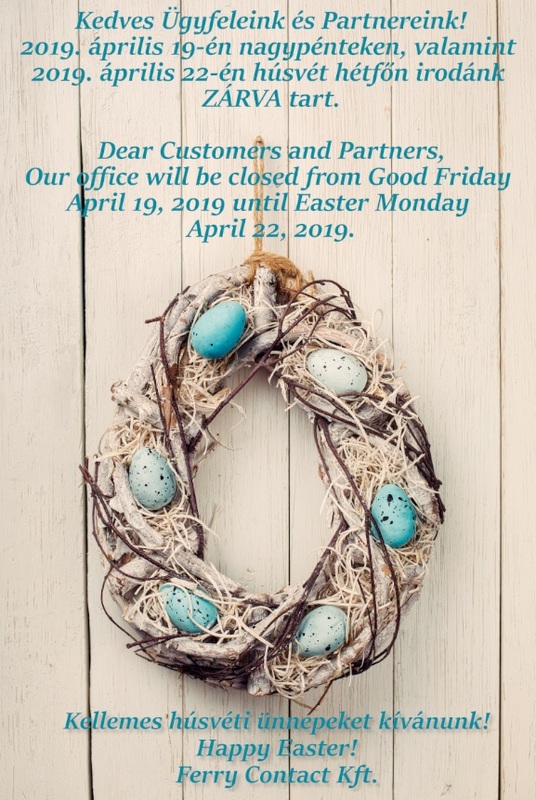 This ensures very high service friendliness. In the Feeder chute the tablets are automatically de-dusted and transported one at a time to the rake system which takes care of the positioning and orientation of the tablets in the test stations. 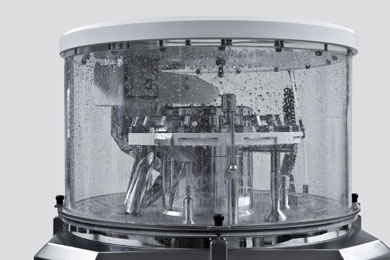 Through the new positioning method in the hardness tester, it is possible to ideally position almost every tablet for diameter and hardness measurement. The tablet stop, the pusher and the transport segment can be ideally adapted for a product. These parts can be exchanged with a few flicks of the wrist for a product changeover. The Kraemer UTS-IP65i is a new further development of our high quality range of automatic tablet testing systems and provides a professional solution for the production of medium and high potent drugs. In addition to our existing dust-tight (UTS4.1-S10) and easy to clean (UTS-IP-LR) systems, the UTS-IP65i represents the first fully washable, universal and automatic Tablet Testing System in the world. Washable tablet testing system for measuring Weight, Thickness, Diameter and Hardness. 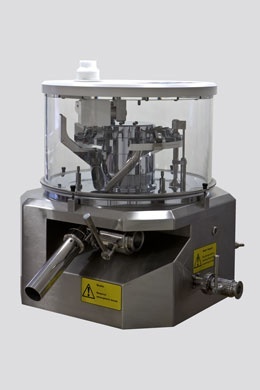 Including patented KRAEMER separating feeder. Standard measuring range for weight 0-60g, thickness 0-10mm, diameter 3-16mm, hardness 5-350N. Operating and display panel for all four parameters, including calibration and validation features. In-and outputs for control and implementation of external devices. The TOUCH SCREEN Option on the UTS is a very user-friendly product that enables you to print reports at any time onto a connected USB-printer. 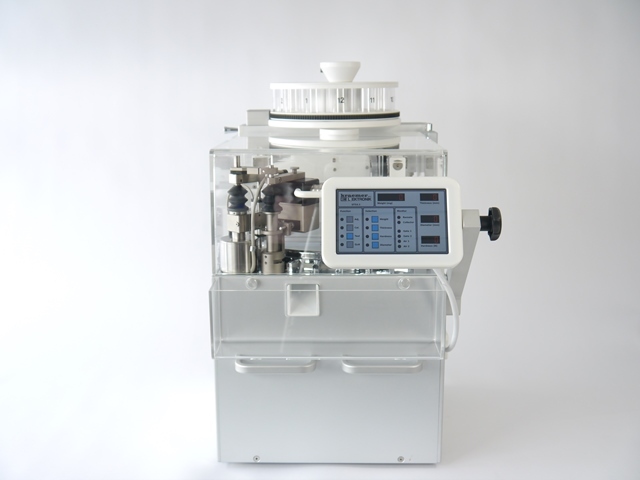 The UTS Touch Screen Option can be connected to any online tester with a tablet press or with existing PH21 Software. A UTS with a standard display panel can be upgraded with a Touch Screen at any time. The Touch Screen can be retrofitted to any existing units.